"Do not speak to me of rules. This is war. This is not a game of cricket." It's commonplace for a film to be less profound than the original book from which it is adapted; the author has the luxury of unlimited pages to make his points, whereas the filmmaker must accomplish it during the span of two to three hours in all but the rarest cases. It's quite unusual for a film to far outstrip the original book, but that is the case with David Lean's production of The Bridge on the River Kwai. Set in Thailand during World War II, the film concerns the prisoner-of-war camp commanded by Japanese Col. Saito (silent film star Sessue Hayakawa). Commander Shears (William Holden) is one of two survivors left in the forced-labor camp when a fresh shipment of British prisoners arrives, commanded by Col. Nicholson (Alec Guinness). While Shears quickly escapes the camp, Nicholson and Saito engage in a battle of wills: Nicholson insists on the letter of the Geneva Convention being followed, which means that the officers are not to be required to engage in manual labor. Saito instead insists that the officers as well as the enlisted men build the railway bridge which he has been ordered to complete by May 12. The British officers refuse and are placed in detention, with Nicholson being placed in the torturous "oven." Nicholson will not be broken however, and Saito has little choice but to give the officers their way when the bridge becomes far behind schedule. However, in a neat irony, Nicholson, as a matter of pride (as well as to maintain morale amongst the men) means to build the bridge well and make it last six hundred years. He reverses the prior technique of sabotage and slacking to make the bridge a monument to the British soldier. At the same time, Shears makes contact with Warden (Jack Hawkins), a British don turned commando, who is ordered to blow up the bridge. Shears is unwillingly volunteered to help lead the expedition back to the hellhole from which he barely escaped to begin with. Considering that the character of Shears and the commando raid are inventions of the screenwriters and not of original novelist Pierre Boulle, it is clear that the book is a very different animal than the film. Lean's version not only focuses on the clash of wills and the irony of the British cheerfully working to further the Japanese war goals, but introduces an action element and suspense to move the film forward, as well as giving an American outsider who is available to comment upon what appears to be complete madness amongst the British. Guinness' character is a highly complex one; he exemplifies both the best and worst of the British military character. While he displays endurance and refuses to crack no matter what horrors are brought upon him, and he does manage to keep many of his men alive through their increased morale and sense of purpose, his rigidity also causes unnecessary suffering and ultimately borders on high treason. Known primarily as a comedian up until this film, Guinness gives a superlative performance throughout, carrying off a kaleidoscopic array of sides of his character. A superb example comes right at the beginning: as the ragged parade of the prisoners enters the camp in strict formation, whistling the infamous Colonel Bogey and marching, Guinness slyly turns his eyes ever so slightly to the side as if to see what effect his gesture has had upon Saito. Holden starts off as a typically American character, but is given depth through his relationship with Warden, particularly in the scene in which he is "convinced" to lead the demolition expedition. Hayakawa occasionally shows a bit of silent technique, but this is appropriate for a character who is speaking much of the time in a second language; much of the power of Saito comes from his broad strokes and gestures. The one scene that doesn't work is the brief shot of Saito sobbing on his bed after he has been forced to give in to Nicholson (despite the fact that the documentary makes it clear that this was a problem scene: Lean reportedly verbally abused Hayakawa to the point that he was truly sobbing real tears!). The film is shot and edited unerringly. Lean carefully stages the picture and uses the entire Cinemascope frame. If you've only ever seen Bridge on television with pan & scan butchered versions, you're in for a real treat. This is a beautifully composed film. By the end, Nicholson's pride has created and realized a grand Shakespearean tragedy of epic proportions. His hubris results in disaster for all concerned in the best Greek tradition. This is probably the greatest dimension added to the novel through the screenplay of the film. Bridge on the River Kwai is one of the most splendid achievements in motion pictures that it's been our pleasure to review thus far. Image Transfer Review: The image is initially a shade disappointing; the first shot of the vulture wheeling over the camp is highly grainy and the opening title segment has plenty of speckles and aberrations. However, by the time the film proper gets going, the picture resolves itself into a gorgeous transfer, with vivid colors, very good blacks (though real blacks are not often seen during the film) and nice shadow detail. I'm surprised that a little more attention wasn't given to the restoration of the opening sequence. The anamorphic transfer is crisp and attractive:; the downconverted version is very good as well. The Cinemascope framing will make the picture quite small indeed on smaller 4:3 televisions, but it still carries off the epic quality quite nicely. There are a couple of other distractions to be found: in the scene in the hospital the picture jitters from side to side briefly; this occurs a few other times during the film. The bit rate is surprisingly low considering the sharp and detailed transfer. At times it drops as low as 2 Mbps but at others ranges around 6 Mbps. Audio Transfer Review: The sound is excellent. The ambient jungle sounds that run throughout the film are the main use of the surrounds, but there is also a little directionality that supports the picture well. Oddly enough, in the opening sequence, the shot of the train disappearing into the distance comes through in the left surround, making the audio appear to be in conflict with the film. This was the only such error in the remix that I noticed, however. Dialogue is always clear and undistorted, as is the music. The whistling of Col. Bogey is occasionally shrill and piercing, but its similarity to the train whistle, which shares these qualities, may have been an intentional part of the sound design to indicate the singularity of purpose of the British soldiers and the Japanese railway. The English Dolby Surround track doesn't sound quite as rich and full as the DD 5.1 track, but it's quite acceptable. A French 5.1 track is included for our friends in Quebec, but alas, Spanish and Portuguese speakers must make do with a 2.0 mono track in their respective languages. Extras Review: The basic version of this DVD includes the isolated musical score (in 2.0) as well as some DVD- ROM content. This version rates a C- for extras content. The Limited Edition version, however, really shines. The second disc of this set includes an original documentary by Laurent Bouzereau on the making of the film (52m:58s), which covers the difficulties in getting a workable script, as well as Columbia's insistence on a bankable American star and the disposable romance sequence. We also learn that Columbia attempted to get Col. Bogey replaced with another piece of music, and how Lean fought to keep the tune which has become the very symbol of the film. The documentary is mostly composed of interviews with film historians and several of Lean's assistants on the film. There is also some behind-the-scenes footage for good measure. This documentary makes it clear just how different this film is from its source book, and what a transformation was made from a merely ironic tale to a grand tragedy. Three short featurettes are also included. Two are period pieces, and show their age quite badly. However, because of their invaluable content, they make excellent companions to the film. The first, The Rise and Fall of a Jungle Giant, is a 6m:12s record of the construction and destruction of the bridge for the film, with plenty of background footage. The second, a short film by USC in its Evaluation of Film series, is hosted by Holden himself. 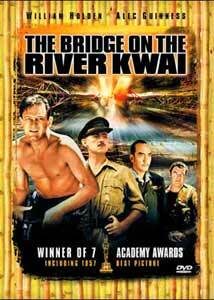 Through looking at Kwai, the 15m:51s film gives acting lessons on motivation and character. There are numerous outtakes of the climax preserved here, showing the evolution of Guinness' final scene through a number of subtle variations. Again, there is plenty of behind-the-scenes footage. The third piece, also produced by Bouzereau, is An Appreciation by John Milius. The 08m:04s film briefly gives an analysis of why so much of the film works as well as it does; Milius gives most of the credit to the script, but acknowledges the role of the director and the cast in making the film as unforgettable as it is. Bios and selected filmographies are included for Lean, Guinness, Holden, Hawkins and Hayakawa. Several trailers of interest are included, one of them being an anamorphic trailer for Lawrence of Arabia which really whets the appetite for a full restoration on DVD of this other masterpiece by Lean. Rounding out the package is a 07m:26s showing of posters and lobby cards for the film throughout the world, including the original release as well as subsequent re-releases to take advantage of the success of Lawrence. The most amusing point is the primary emphasis a la From Here to Eternity placed upon the romantic interest which only takes a few minutes of the film. I find it hard to give an 'A' grade to a disc that doesn't include a commentary, but this limited edition rises to the challenge. A splendid and unforgettable film, with superb characters expertly drawn, is here given a nice transfer and a boatload of extras. A must-buy for anyone who loves film. Spring for the limited edition; it's worth it.